I have quite the nail extravaganza for you tonight. 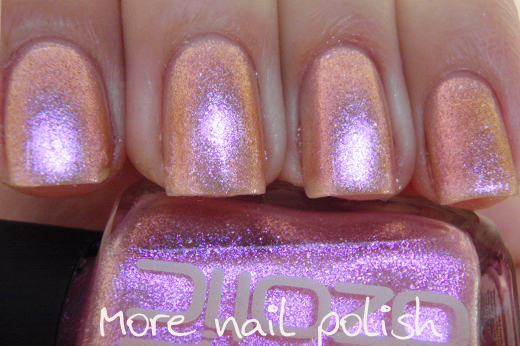 Eight blog posts, each one featuring one of the new Ozotic 900 series polishes. I'm absolutely delighted to have teamed up with the girls from piCture pOlish to bring you this live, joint facebook blog launch. 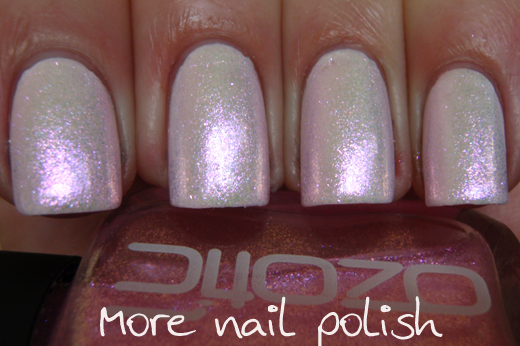 So lets get right into it with the first Ozotic 900 polish. The first fours shades made up the Sugar range. The range is inspired by adding a tiny drop of colouring to icing sugar, and let me tell you all these shades look finger licking sweet and sugary. 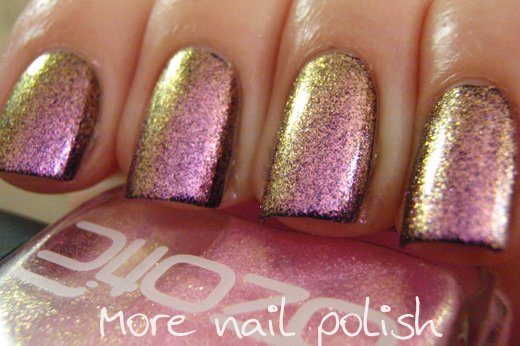 Ozotic 901 Sugar shown here as one coat over black. 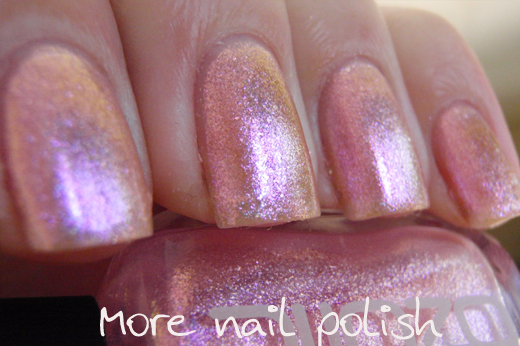 In the bottle it's a sparkly iridescent pale pink. 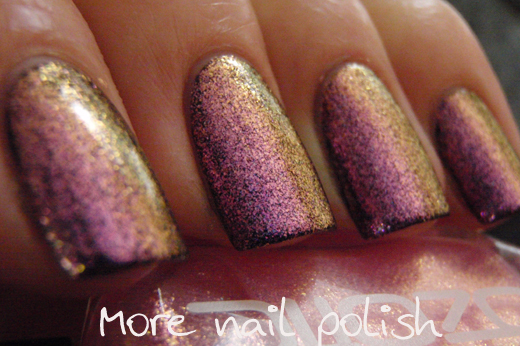 On the nail it is pink, purple, orange, gold and olive. If you plan to wear just one coat, you need to ensure you don't wipe over your nail too much, otherwise you will remove the glass flecks and it finish wont be smooth and even. For these one coat pictures, I just wiped down my nail three times, once on each side and then down the middle. I found that gave me the smoothest finish. This macro shows one coat over back. 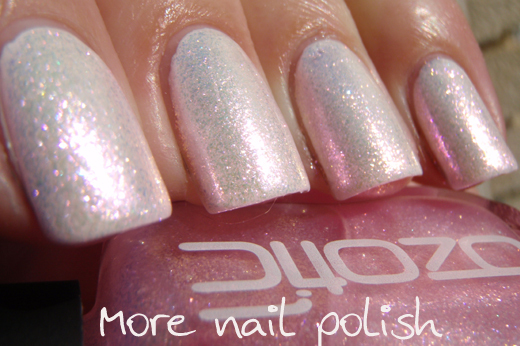 The polish is made up of stunning reflective duochrome glass flecks. Here is two coats of 901 over black. With two coats, you don't need to be worried about application, because two coats smooths it out nicely. At two coats the finish looks less glass fleck like and much for foil and reflective. 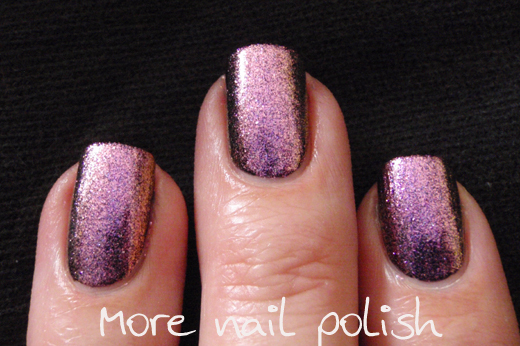 I love how foil like this polish looks, but a duochrome foil - it's very cool. 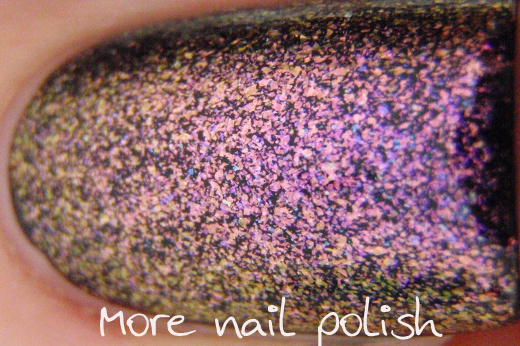 It reminds me of the Orly Cosmic Effects polishes from a few years back, except with more layering possibilities cause of the sheer base colour. Next I decided to try it layered over white, and now it looks like sweet sugar covering icing. This is two coats over a white base. Finally, here are some shots of Ozotic 901 on it's own. 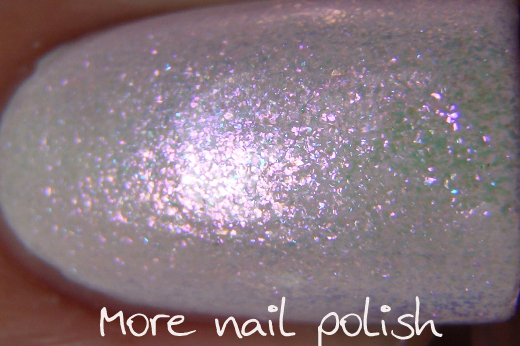 I didn't think it would achieve opacity, but at three coats it was pretty good. Thanks for visiting, come back real soon (like in about 5 minutes to see the next shade). Gorgeous! it's definitely going on my wishlist! Out of all the posts, this polish is definitely my favourite! Thank you for the swatches! !